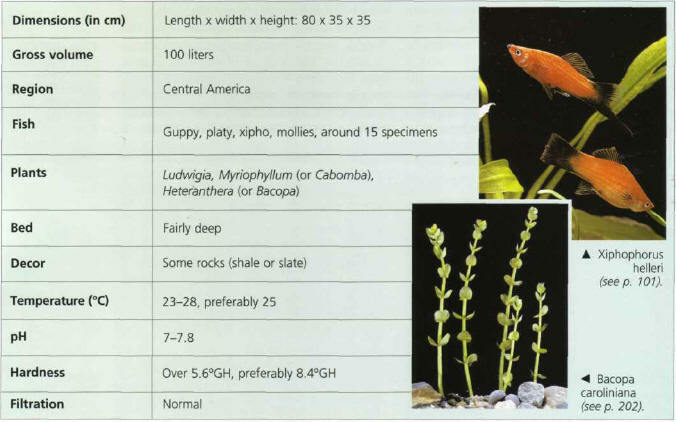 This type of aquarium, particularly suitable for beginners, reconstitutes a freshwater Central American environment. The fish living in it (the Poeciliid family) will soon reproduce if the conditions are right. It is advisable to provide yourself with a rearing tank, to help the fry develop. You can then move on to the true livebearers coming from the same geographical region: Anieca splendens and Xenotoca eiseni. The plants shown here grow fairly quickly and it is easy to take cuttings from them; they are therefore a good means for taking your first steps in plant decor, which is sometimes neglected by beginners at the expense of fish until they realise the importance of vegetation. ЛИБЕРА (Libera) Адальберто (1903-63) , итальянский архитектор. Работал в лаконичной рационалистической манере (павильоны и арка для Выставки фашистской революции, Рим, 1932).